When Danny was younger we never seemed to have enough base plates (especially once the three girls began to play with him too). The branded base plates were expensive and only available in green. Not anymore, it’s now possible to build up an affordable collection of base plates. Strictly Briks are bright and colourful (they are available in 36 colour options). Firstly, Strictly Briks Stackable Base Plates are suitable for 3 Years +. This interlocking brick-based toy offers the opportunity for building. They could build a house, castle, towers or parking garage there are no rules to this game the choice is yours! 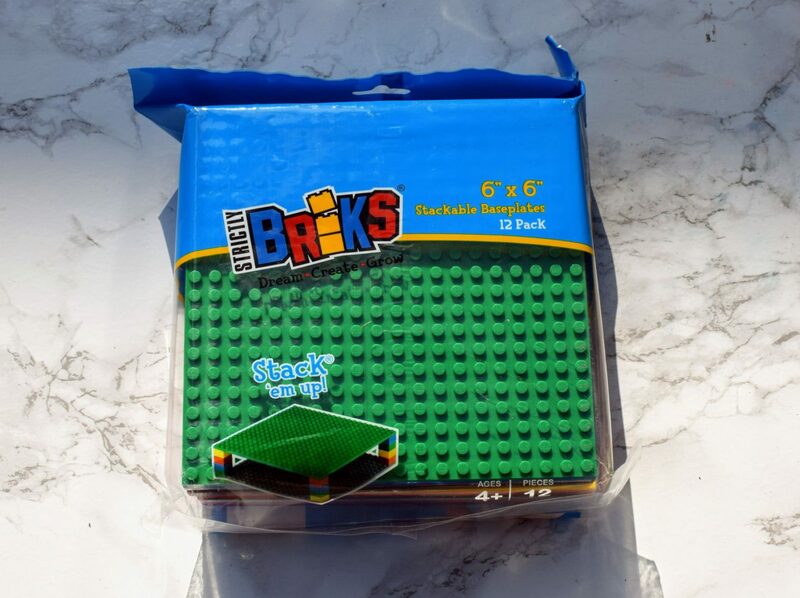 Most importantly, due to its versatility Strictly Briks® items are compatible with all major brands of large bricks, including LEGO® DUPLO® and Mega Bloks® brand sets so that you can mix and match and still get as much use of children’s existing toys. Strictly Briks are not affiliated with any of the brands mentioned. The Premium Rainbow Coloured 6″ X 6″ Construction Base Plate 12 Pack available to buy online from Amazon for £17.99. Having a substantial collection of base plates has helped encourage our children to build even more creative builds individually in a short space of time. 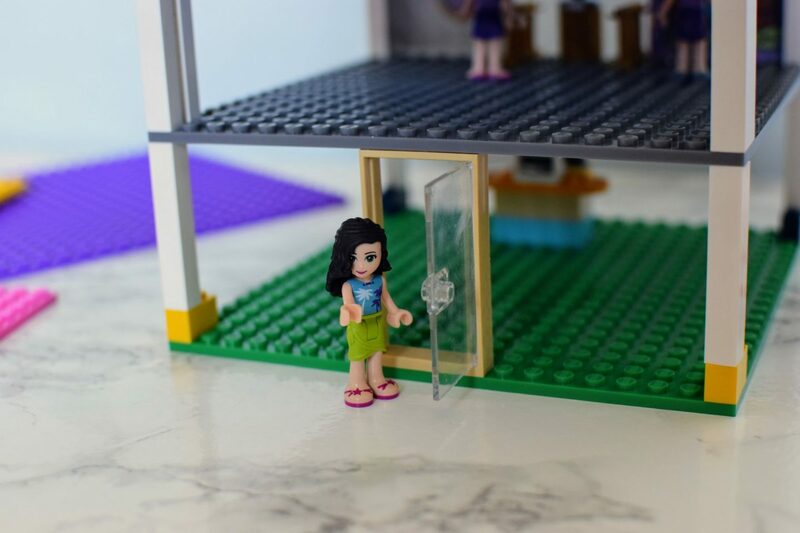 They can now make play sets and buildings that are great fun to play with. So far they’ve made a house, a garage, an apartment block, a castle and a dinosaur park. In the past the green bases have been used for grass, now we also have ice, water, sand, rocks, carpet and all sorts of bases to build our creations on. 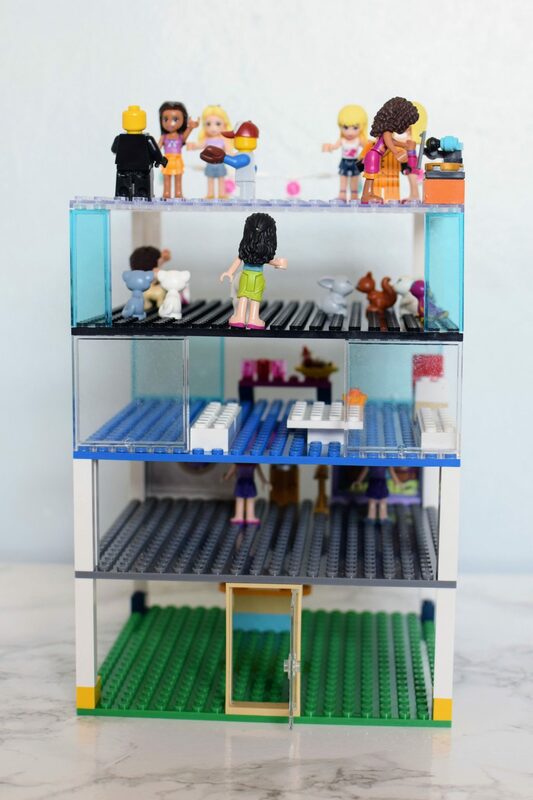 Our kids used their current LEGO to stack the bases but this pack is also available with stackers for £24.99 or you can purchase a pack of 180 stackers for £14.99. 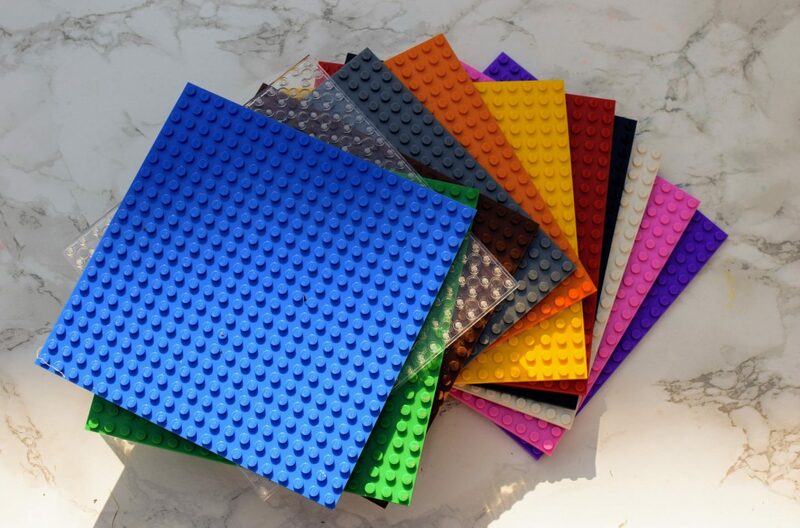 Strictly Briks Rainbow Construction Baseplates would also make great additions to party bags at a LEGO/construction themed party (individually they cost just £1.08 each). Parents could have fun customising children’s furniture with them too. 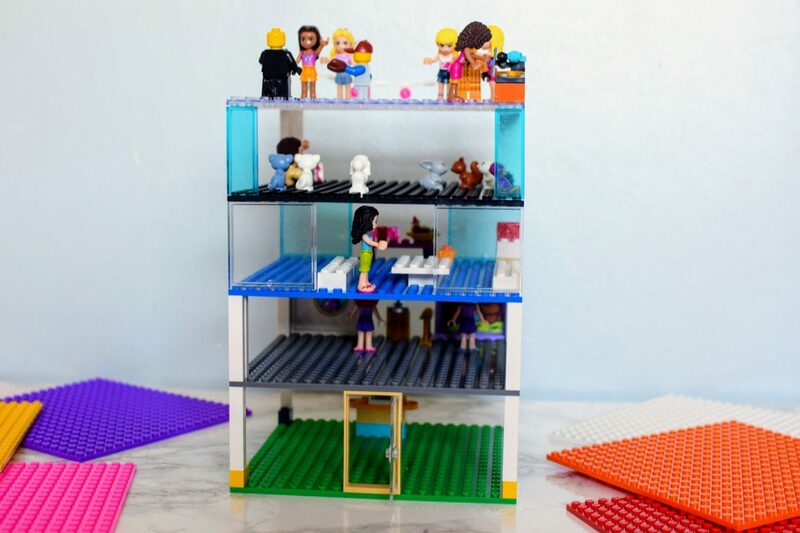 You could create a LEGO table or display area on top of your LEGO/bricks storage. If your child enjoys making 2D brick creations you could put up a fun gallery wall to display their work. These multipacks of baseplates would be ideal in nurseries, classrooms and play areas. It is possible for every child to have a base plate to create on (often there are not enough to go around). They make a welcome gift for any brick loving family. 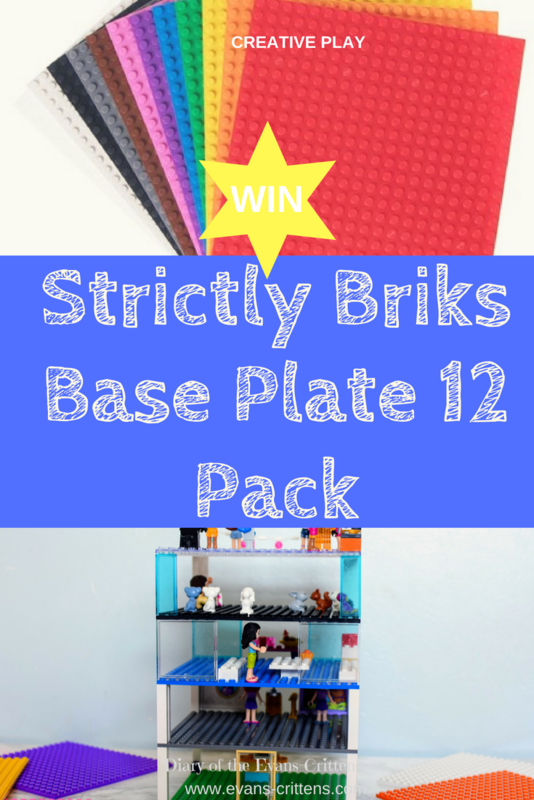 For the chance to win a set of Strictly Briks Premium Rainbow 6″ X 6 ” Construction Base Plates please enter the easy Rafflecopter below. Remember to read the terms and conditions. Good luck! We were sent this set of Strictly Briks Premium Rainbow Coloured 6″ X 6 ” Construction Base Plates for the purposes of this review. Opinions are honest and our own. Strictly Briks are not affiliated with or sponsored by the construction brick brands. A farm house, yard and stables! She would almost certainly make houses for cats, dogs and chickens. A house for his star wars characters. My niece would use these for her LOL dolls, Lego and Playmobil people. She’d build houses as she loves doing this! Defiantly a house for all her Lego friends characters. Knowing her, probably a space station!! I think my girl would make a house or a school…She loves playing teachers. My boy would make a little fire station for his fire engines. I think I’d like to help my nephew build a road and garage. My son has been trying to make a space station with the little Lego baseplates from a set he got for Christmas. With these he could make a massive space station. Ronan would make a wrestling ring!